On a recent morning, Kim Housken and Don Graybill (volunteer sleuths from the Historical Society of Palm Desert) squished into my Subaru and we drove off through the stately pines and meadows of Garner Valley in search of Agnes Pelton’s cabin. 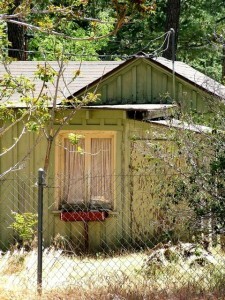 It’s well known that in 1941, at age 60, Pelton bought a cabin in the mountains above Palm Springs. Yet for all these years no one has known exactly where it was. Occasional inquiries to Pelton scholars and mountain historians over the years have turned up nothing. Why did Agnes go to the mountain, anyway? After all, she had a fine view of her beloved San Jacinto peak from the porch of her Cathedral City home. Why buy a second place? The prosaic explanation is—like everyone else who lives in the desert—she wanted to get out of the heat. On another level, Agnes Pelton was always reaching for transcendence, and in the last years of her life that transcendence was represented by Mt. San Jacinto. She wanted to get closer. Those of us who love Pelton’s work knew we had a righteous art-historical quest on our hands. But first we needed a break in the case of the missing cabin. 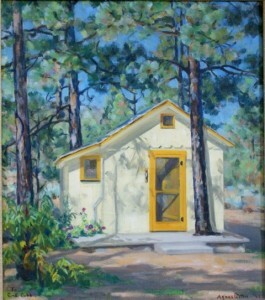 Agnes Pelton's painting of her cabin, 1943. Courtesy of Kirk and Linda Edgar. The first came when Robert Hillery, first mayor of Cathedral City, and a family friend of Pelton’s, drew a map showing us approximately where the cabin had been: in the little cluster of dwellings called Thomas Mountain. Pelton bought her cabin from its builders, Claude and Edna Cobb, owners of the first market in Cathedral City. The Hillerys owned the cabin next door, and used to give Pelton rides up the hill. (She didn’t drive.) Still, since Bob didn’t recall the address, we needed more clues. The next break came when Long Beach art collectors Kirk and Linda Edgar e-mailed an image of a Pelton painting they’d just purchased—a white cabin with yellow trim. It was dated 1942 and inscribed: “To C + E Cobb.” I ran the painting by Bob Hillery and he said, indeed, it was the Cobbs’ old cabin, the one Pelton had bought from them. Now Kim and Don and I had our motivation to drive up the famously serpentine Highway 74. After stopping to look in the busted windows of a historic roadhouse (this group loves ruins) we turned into a neighborhood crowded with humble abodes. We drove slowly down Barbara Lee Drive and started looking for a place that matched the painting. Specifically we were looking for a listing pine tree growing through a porch, a steep roof, an aura of genius. The cabins were pressed close together, the old jumbled with the new and everything added-onto and remodeled. Nothing looked like the cabin in the painting. I would have driven right by the place, given up and gone home, but Kim was equipped with a historic plot map and also a better eye for detail. Agnes Pelton's cabin today. Photo by Kim Housken. 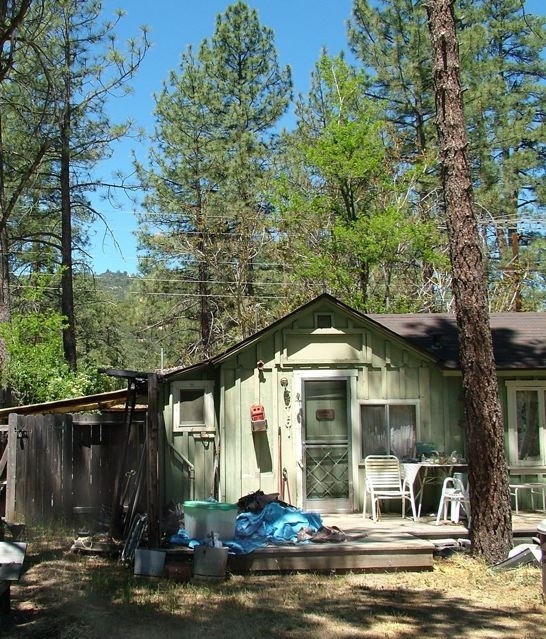 We parked in the shade of the pines and gawked at a house littered with blue tarps, multiple garbage cans, discarded lumber and trash. There was a pine tree in front. It wasn’t growing through the porch (the porch had been cut away and the cabin expanded) but it had the exact same lean as the tree in Agnes’ painting. About the time I realized for sure this was Pelton’s cabin, a baby began wailing next door and the neighborhood dogs set to barking. The baby’s mother came outside and told us there was no one home at 35161 Barbara Lee (Pelton’s place) and it was alright to walk around the house. We stomped up on the porch like a team of zealous home inspectors, taking photos of the leaning tree, each other and details like the “Chipmunk Manor ” sign above the door. Don scraped a sliver of the original yellow trim hidden under more recent layers of paint. Kim found some old bedsprings stashed beside the house and wondered if she’d found a Pelton artifact. We knew Pelton had taken strolls right out the back of her cabin and into the ribbonwood forest, so we drove around and parked on a back street. There was a big meadow between us and the back of Pelton’s house. 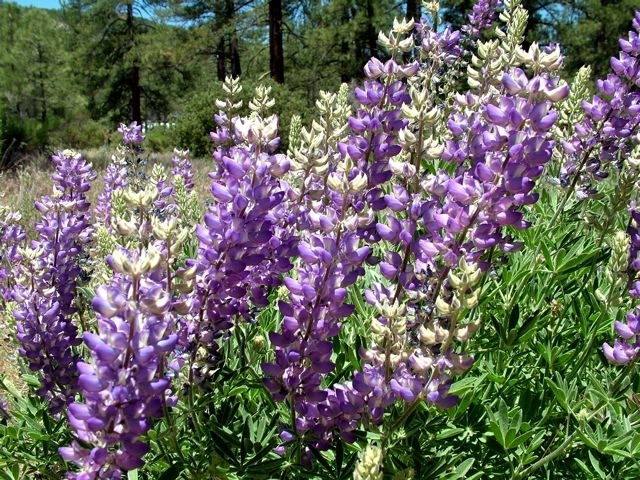 We walked through a field bright with red Penstemon and purple lupine, and then paused in a clump of tall Jeffrey pines. We just knew this was Pelton’s private grove. For me, the sense of her presence was stronger here than it had been around the Cathedral City house or on the porch of the cabin. Pelton's cabin from the meadow behind. Photo by Kim Housken. Before we left I stuck a note behind the screen door and the next day the owner, Steve Moulton, telephoned. He’d never heard of Agnes Pelton and had no idea he was living in a historic residence. He told me he owns Bubba’s bookstore in Idyllwild and hauls trash for extra money (thus the trash around the house). Even with the more recent addition to the cabin, he says it’s only 450 square feet, which made us wonder how Pelton even managed to paint in there. Sincere thanks to Steve Moulton for allowing strangers on his porch, and to Bob and Kay Hillery and Kirk and Linda Edgar for helping to solve the mystery of Agnes Pelton’s cabin. Lupines behind Pelton cabin. Photo by Kim Housken. Ann,great job! Mystery solved. Agnes probably painted mostly outside.I’m so happy I was up there painting the same area, unknown until I saw your photos. Yes, San Jacinto is mystical. From my back gate rays from the sun peak through the clouds after a storm, or near storm. I have a canvas on my easel right now of this beautiful event. Honestly it looks as if Christ might appear for the second coming. Thanks, Ann, for finishing the story and taking me on your journey to find the cabin. I can imagine Agnes going to the mountains to get out of the heat in the desert. 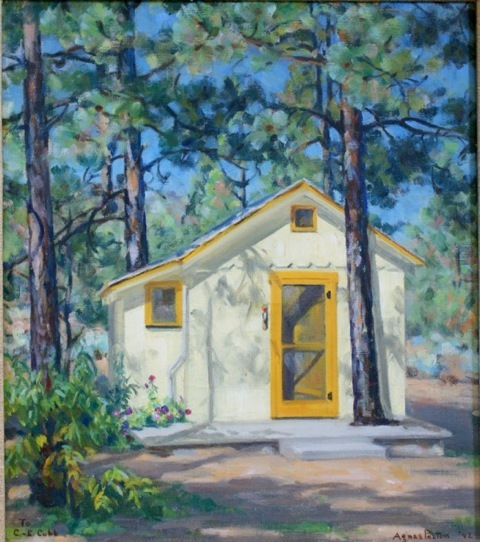 She didn’t need a big house, just a cabin and a place to paint. Ann,I loved reading this story. What an adventure — I felt like I was with you. Can’t wait for next year’s Desertscapes–it was a grand experience. “coincidental” that I was browsing Agnes links this morning and chanced upon your article. (Peter and I now own the Pelton house in Cathedral City.) i am intrigued to make the trek to the cabin, visit the surrounding areas you describe, and meet Steve Moulton. Hope all well with you. We adore our home and life here in the desert and cherish and honor the lingering presence of Agnes. Hello, Thank you for the information. My Father was a friend and played cards with Agnes in the desert. He and his friends held s few art dinners for her in Casa Dorado in Indian Wells in her later years. I own a few of her works and since I was a child. My father was Dr. K. K. Phillips, my sister Marie LaCroy was written about on the first book Michael’s book. I am a local artist and design Christmas displays for western States Holiday Decorators, so I love art and love her very soul and love of god. I love her abstracts ans wish she had had a better chance. But oly woman who had males helping them made real money. But she did run with a very lucrative living. Thank you for this infor mation it is nice to know. Our painting of Agnes’s cabin is currently on display at the Cathedral City Hall. We drove to the desert for the opening of the exhibit and decided to go see the cabin as it stands today. 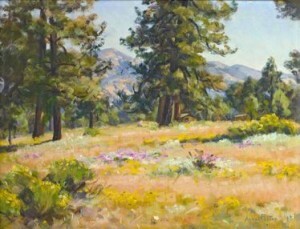 As we drove up the mountain from the valley I kept wondering when we would see the tall trees found in the painting. We almost gave up, thinking we went the wrong way, nothing matched the painting. After 30+ miles of winding road we reached Thomas Mountain with its lovely ranch homes and pine trees, we knew we were near. However all the houses looked new as we drove up and down streets. After talking to someone at a mailbox we found our way to the original cluster of cabins and street sign “Barbara Lee”. We drove up the quiet street and there it was. I took a deep breath and slowly said “Agnes’s cabin” and did move for a few minutes. So this is were she spent time thinking about new designs for her paintings. I had to look at the sky and thought about what it must look like at dusk. I thought about her most famous paintings with their pulsating skies. Our painting now has a clarity I did not know before. I had to touch the tree and pick up a piece of bark. Thank-you everyone that helped find the cabin. A very special experience for us. One more note about Agnes Pelton, she has received some national press. See the magazine “American Art Review” May-June 2013 page 85. Article about the exhibit “Channeling Agnes Pelton: Portrait’s, Landscapes and Readings” at the City Hall of Cathedral City. The cabin painting is one of the paintings illustrated. I spent some time sitting in front of your cabin painting yesterday at Cathedral City Hall. The longer you sit there the more you feel like you can see inside the slightly open front door and glimpse Agnes puttering inside. This is my favorite painting from the exhibit, which is up through June 27, 2013.